Abcam's Cellular Membrane Potential Assay Kit (Fluorometric - Orange) (ab176764) is a homogeneous assay with fast read time. It uses a proprietary long wavelength membrane potential indicator to detect the membrane potential change that is caused by the opening and closing of the ion channels. 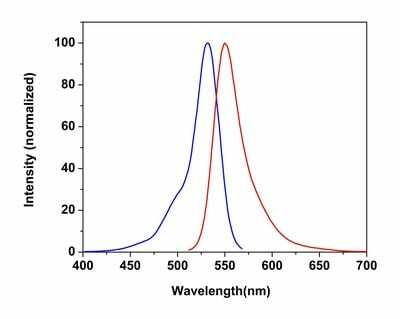 The red fluorescence of the membrane potential indicator used in the kit has enhanced fluorescence upon entering cells and minimizes the interferences resulted from the screening compounds and/or cellular autofluorescence. WSS-1 cells were seeded overnight in 50,000 cells per 100 µL per well in a 96-well black wall/clear bottom plate. The cells were incubated with 100 µl of ab176765 for 30 minutes at room temperature. 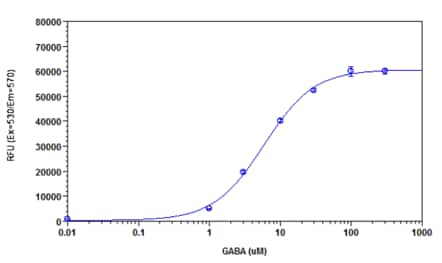 GABA (50µl/well) was added to achieve the final indicated concentrations. ab176764 has not yet been referenced specifically in any publications. Publishing research using ab176764? Please let us know so that we can cite the reference in this datasheet. There are currently no Customer reviews or Questions for ab176764.